Little, Brown Books for Young Readers, 9780316370943, 40pp. A celebration of the wonder and colors of every child's favorite season--summer! In this celebration of the outdoors, two rambunctious children take off on an adventure from their own backyard. In each new scene they discover the wondrous details--and beautiful colors--of nature. Even when a little summer rain threatens to dampen their grand adventure, the fun continues as woodland scenes come to life in a whole new way. 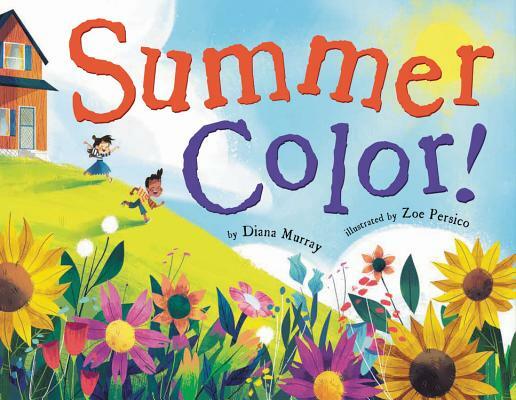 Diana Murray's spirited verse paired with Zoe Persico's charming illustrations hits a wonderful balance of sophisticated and sweet, with details that young children will immediately relate to and layered verse that will enchant readers of all ages. Diana Murray loves to sit on her patio writing stories and poems, especially to the sound of passing showers. She is the author of many children's books, including City Shapes, Grimelda: The Very Messy Witch, Doris the Bookasaurus, and more. Her poems have appeared in magazines such as Highlights for Children, and Spider. Diana grew up in New York City and still lives nearby with her firefighter husband, two daughters, a lizard, and a hamster--all of whom enjoy sunny summer days. Zoe Persico is a lover of rainstorms rolling in on summer afternoons, and of all things color. She enjoys illustrating for children's books and animation, and some of her clients are Dreamworks TV, Sesame Workshop, American Girl, and more. Zoe grew up in the Midwest, and she currently resides in the Pacific Northwest where the rain never seems to really stop, but gives her plenty of excuses to go stomp in puddles.